It’s that time of year here in Florida, hurricane season. Tropical Storm Isaac is making his way into the Gulf of Mexico and even though we are not in the direct path (yet) we will still have some wind and rain. They even canceled school tomorrow, my kids are really disappointed (yeah right ). So I am posting a favorite cake recipe, I find I like to bake on rainy days. This one is dark and decadent, a favorite from my Southern Living Cookbook. Pre heat oven to 325. Melt chocolate chips in microwave or double boiler. stir in chocolate syrup and stir until smooth. In a large bowl or stad up mixer, beat butter on med speed until creamy and add sugar, then eggs 1 at a time. In a med bowl mix together flour baking soda and salt. add 1/2 to butter mixture mixing on low speed. Then the buttermilk then the rest of the flour, mixing the whole time. stir in vanilla and chocolate mixture and pour into a greased and floured bundt pan. Bake for 1hr and 20 minutes or until a toothpick inserted into the middle comes out clean. Cool cake in pan on a wire rack for 15 min then turn pan and invert cake on to the wire rack, cool for another 30 minutes. For frosting, stir together powdered sugar, milk and vanilla in a small bowl. 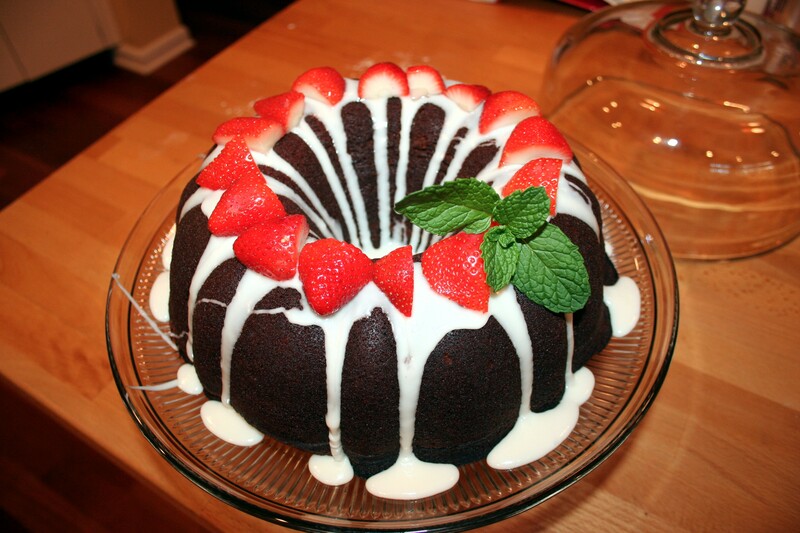 Pour over cooled cake and top with strawberries.